I should note that this is NOT a sponsored post - I was not paid by any of these companies and I did not receive complimentary meals from them for inclusion in this article. Some services had discounts for new subscribers at the time - but I didn't get any special treatment for being a blogger. In fact, I didn't tell them I was a blogger and I paid for all these home delivery meals myself. That being said, I have since reached out to some of these companies in order to get a referral code that I could share with you to get you a discount if you'd like to try the service. If you order a meal delivery service through any of these links, I may receive a small kick back from the company. Even though I am personally gluten free, not all the boxes are right for gluten free families, so please be sure to read my review for each of the meal delivery services (or at least skip ahead to the report card in each section) before ordering. 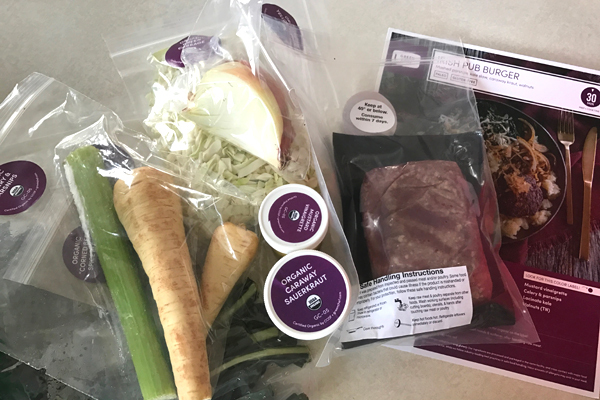 Our first attempt at starting healthy home delivery meals was with Hello Fresh. I had a promo code to get a discount on my first box so excitedly signed up. I chose three meals on the Family Plan - which says it provides recipes and enough food for two adults and two kids. I didn't see a way to choose a gluten free option (I am gluten free) but the FAQ said that all the focus is on fresh ingredients and all the ingredients are packed separately so you can just leave out ingredients that contain things you are allergic to. "Okay," I though, "I'll try it. If something has soy sauce or something, I will swap it out." Don't want to read this whole review? That's ok! Click here to get started with Hello Fresh now and get $30 off your first box! You guys: Two out of three of these meals definitely have gluten in them. The "Honey-Ginger Glazed Chicken" wasn't labeled as containing wheat but it has soy sauce in it. I have never seen "soy sauce" (as opposed to tamari) that does not contain wheat so that is suspicious, too. I would have stuck with the Honey Ginger Glazed Chicken and just swapped out for my own tamari or coconut aminos but the other two recipes have wheat as the backbone of the recipe - in the pasta or the tortillas. Hoping it was a fluke, I flipped through the upcoming weeks' menus. Every single weekly menu had 1-3 recipes containing gluten. Clearly this was not going to work for my family. I called their customer service line and explained what happened and asked if one of their other plans had better gluten free options. Sadly they didn't so the helpful woman I spoke with cancelled my membership and issued a refund without issue. I thought my experience with Hello Fresh was done there. Surprisingly, though, a few weeks later I was charged full price for another week of meals! The first customer service rep had only cancelled the introductory week of meals and not my entire subscription as requested. Luckily, their customer service was very easy to deal with. A quick email resolved the problem and they promptly refunded my money. Tired of reading? That's ok! Click here to get started with Hello Fresh now and get $30 off your first box! When I opened the large box it came in, I loved that each meal (except the meat, which was separate) was packed in its own cardboard carton - I didn't have to sort anything! The cartons were each clearly labeled as to what was in them and I just popped them each in the fridge. I did have to modify the braised chicken thighs recipe by preparing my own quinoa to go with it instead of the included couscous and I skipped the "dredge in flour" step for preparing the chicken. The ginger beef stir fry was very good (although the ginger that shipped in the box had spoiled but luckily I had some on hand). We served the pork burgers without buns on top of the salad instead. So did it make my life easier? The meals were easy to prepare and my family (including the kids) liked the food. So that was a win! I loved that everything for dinner was waiting for me in that little box and I just had to grab it and follow the instructions. The instructions were easy for me to follow but would have been too hard for my child and maybe even my husband (due to their limited culinary skill levels) to follow without help from me. The portions were good- which was a primary concern I had especially since my husband eats a lot. In fact, we had enough leftover from chicken night that he brought it to work the next day for lunch. He told me when he woke up the next morning that he had dreamed about the chicken leftovers in the fridge all night long--which I would say is definitely a clear sign that the meal was a winner! In conclusion: This meal plan is very convenient, tasty, and has great portion sizes. The main reason I will not be subscribing on a regular basis is because there is no way to customize the meals to be gluten free. If your family is NOT gluten free and does NOT have other food allergies (since there is no way to customize your box), I definitely think you should try them! I do wish the ingredients were organic BUT I feel like it's fair for me to compare these meals kits to the take out options available in my area--because let's be honest, we order a lot of take out from the Mexican restaurant two blocks away on nights I am too tired to think about dinner. 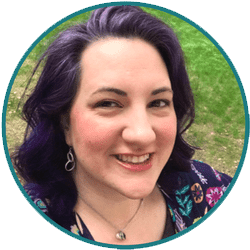 Price: Get $30 off your first week OR $20 off of each of your first two weeks when you use one of these links for Creative Green Living readers. After the intro week(s), your rate will vary based on the plan you choose. Take a look at the different Hello Fresh plans available here. Best for: Families with no dietary restrictions. Want to try it yourself? Use our referral link to get $30 off your first box. As soon as I cancelled my first Hello Fresh order, I found Green Chef. Their main selling point is that all of the food from this meal delivery service is organic - which I love since that is how I prefer to cook in my home. My initial options for customization were "Omnivore" or "Carnivore." They also gave a "four free meal" credit so the first order clocked in at only $56.46 for three family size meals. Don't want to read this whole review? That's ok! 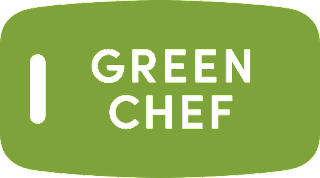 Click here to get started with Green Chef now and get FOUR FREE MEALS in your first box! After paying, I was able to see the menu and the upcoming meal delivery that was scheduled to send out on the family plan contained wheat. Luckily, Green Chef has BOTH a gluten free plan option and a paleo plan option so I switched my account to that. To do that, I did have to switch off of the family plan and onto the "2 Adult" plan. I hoped the adult portions would be big enough to feed two adults and a six year old (and a two year old who usually boycots dinner). The order arrived in a box that I was SO GLAD didn't have Styrofoam. They used an interesting commercially compostable material made from jute as well as reusable ice packs. My order arrived three days late (FedEx's fault - not Green Chef's) but the insulation kept most of the food fresh for that three day window when it was sitting in a FedEx facility. When I emailed Green Chef about it, though, they gave me a credit to get a whole new box for free - so I was very pleased about that. Similar to Hello Fresh, the instructions were easy for me to follow but I wouldn't have wanted to put a child or my husband in charge of making dinner. The recipes did have me trying new techniques I don't normally use to cook and it helped get me out of my regular routine - can you believe I have never tried parsnips before? I loved them! Tired of reading? That's ok! Click here to get started with Green Chef now and get FOUR FREE MEALS in your first box! The results were very tasty even though they were not recipes I normally make. I plan to make the Irish Pub Burger again. The Cherry Balsamic Chicken was a bit spicy for even my adventurous eater but he endured with a glass of milk by his side. The portion sizes were good - in the context that these meals were supposed to make only two adult portions and not a family size meal. I was actually feeding two adults and one kid and there was barely enough to eek out those portions. I may have had to give the kids a snack after dinner if they were still hungry since there was not enough for seconds. In conclusion: The Paleo plan's description of "eat like an epicurian caveman" was quite accurate. These were fancy, grown up dishes but were very tasty. The main downfall for my family (2 adults, 2 kids - including one person who can't eat gluten) was that the family plan was not able to be gluten free. That meant in order to get foods I could eat, we had to order from the two adult plan and that meant smaller portions for everyone. (Green Chef: If you're reading this, please add a gluten free family plan option!). Their chefs have good taste, though, so if you are a family with only two adults (maybe with a very small kid) OR a four person family with no dietary restrictions, I'd definitely recommend you try them. Best for: Small families or couples (when ordering on Two Adult plan) or 4-5 person families with no dietary restrictions (when ordering on Family plan). Want to try it yourself? Use our referral link to get four free meals in your first box. One of the things that makes Freshly unique is that you don't have to do the cooking. The meals are made fresh and then sent to you already-assembled and ready to heat up. This is by far the plan that involves the least amount of work once the meals arrive. Don't want to read this whole review? That's ok! Click here to get started with Freshly and get a discount on your FIRST TWO WEEKS of meals! I was disappointed in the portion sizes, though. The pictures of the meals I ordered (above) which were taken from the Freshly website show easily double the amount of the sides included in actual meals sent by Freshly. Now, these meals DID taste better than any microwaved meal I have ever had in my life - but they come with a price tag to match. During your trial period, you pay $6.50 for each meal but the price goes up to $9.80 per meal after your first box. I don't know what food prices are like in your area but I can get take out from Chipotle for less than that - and get almost twice as much food. If you are house bound (or office bound) and just are not able to get out to get a "real food" meal that isn't full of lots of preservatives and questionable ingredients, these might be a great option for you. These could also be a great thing to send as a gift to a family who just had a baby, is recovering from an illness or an elderly relative who has a hard time cooking nutritious food for themselves any more. If you are a working parent and your kids are old enough to use the microwave and are often on their own for dinner, this would be a great way to get some healthy food into them with minimal effort on their part. For me and my family, I didn't feel like these were a good enough fit for our lifestyle of eating family meals together each night to continue our subscription but I think the service is valuable for other types of lifestyles listed above. Best for: Busy individuals who don't have time to cook but still want real food meals. Would make great meals to bring to office, for elderly, teens or people who don't like to cook. Want to try it yourself? Use our referral link to get a discount on your first two weeks of meals with Freshly for only $39 to try them for yourself. When I called my sister to tell her about the experiment I was doing with meal delivery services, she bemoaned that she had tried a few of these but since she has a large family (there are 7 of them), she found some of these services hard to use. She did tell me that she had found Home Chef and when she ordered meal delivery service, she got it from them since they were large family friendly! Since she had been a subscriber for a while, she had a code to get me some free meals so I ordered a box to check them out! Home Chef lets you choose exactly which meals you would like and how many portions you should be sent. I chose the bone-in pork chops with maple butter and roasted skin-on chicken for four people. I did notice that while Hello Fresh, Green Chef and Freshly use a lot of novel ingredients and cooking techniques, Home Chef seemed to use mostly classic American dishes like you might find in a Better Homes and Gardens cookbook. Don't want to read this whole review? That's ok! 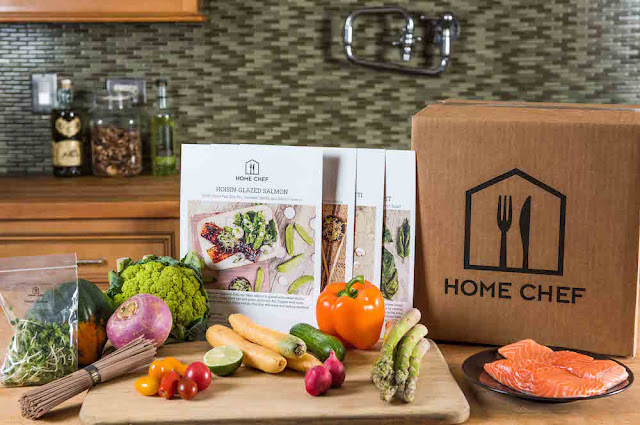 Click here to get started with Home Chef today and get $30 off your first box! The order came pre-sorted for the different meals, which was great and made things easier (meat was packed separately in case of leakage). They also sent me a binder with some great basic info about cooking and kitchen equipment - not stuff I needed but this would be great if you want to use a box like this to help teach a teen how to cook! I also loved the binder because it provided a great place to store the full page recipes they sent and you essentially build your own cookbook as you continue to get boxes from them. Pretty clever! The meals themselves were tasty - not in a super interesting, gourmet type of way but in a satisfying comfort food sort of way. My kids and husband liked them and nobody complained (hooray!) BUT nobody spent the whole night dreaming about the leftovers either. 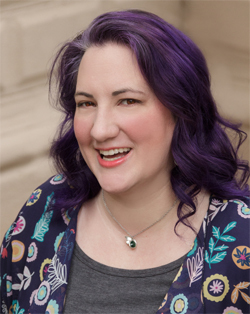 I mention this because for my family, we preferred the Green Chef meals - those were the meals both my kids and husband raved about. However, I know that my way of cooking isn't for everyone. If you prefer to be less adventurous and stick with well-known American favorites, this is the meal delivery box for you! One special thing of note that I liked about Home Chef was the optional add-ons. You can add smoothies, lunches or a fruit basket. I did not try any of these options myself but like that they are available. 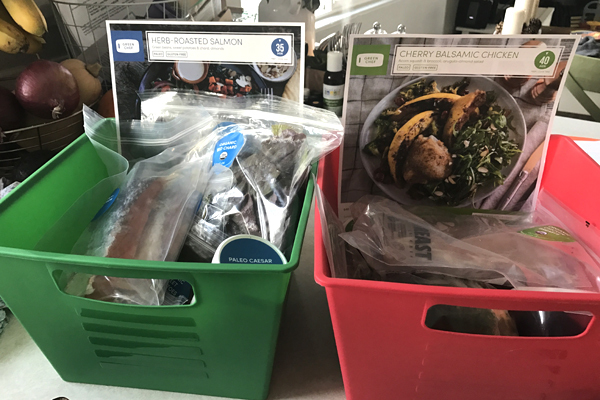 Options like this really make it easier for families who are trying to save time grocery shopping since you can get some of the things you might need to pick up sent to you along with your Home Chef box. Tired of reading? That's ok! Click here to get started with Home Chef today and get $30 off your first box! One of the things I really appreciated about Home Chef was the ability to PAUSE your account. With all the other services, you either have to cancel altogether OR remember to log in once every 4-6 weeks to manually "skip" weeks if you want to keep your account active but not actually shipping you meals. So bravo to Home Chef for making that easier. In conclusion, this box would be best for families who like tasty but non-adventurous foods, beginning chefs, and families with more than four people. 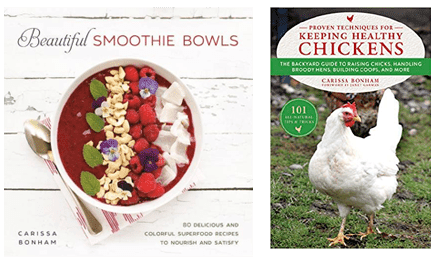 Price: Their regular prices start around $9.95 per portion although you can get $30 off your first order by using the Creative Green Living affiliate link. If you order three different two person meals, that ends up amounting to about half-off the price of your first box! Best for: Families who like tasty but non-adventurous foods, beginning chefs, families with more than four people. Want to try it yourself? Use our referral link to get $30 off your first box! - PLUS Meal Delivery Service Discount Codes! In conclusion, each of these meal services serves a really specific demographic of people. 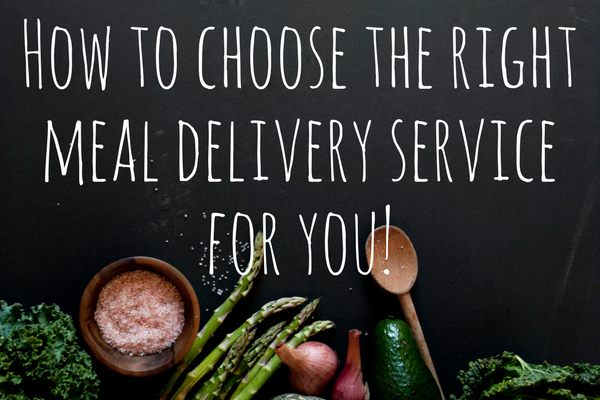 It's also important to note that none of them were bad - so if you are scared to try one of these meal delivery services, don't be! Use the discount codes below to get yourself a great deal as a first time subscriber and experiment! Don't be afraid to try more than one service, either! GREEN CHEF: My personal favorite. This one is best for people who prefer organic ingredients. They have lots of customization options and have three meal plans that are certified gluten free! Try it: Use my referral code to get four free meals in your first box! HOME CHEF: Easy American classics that are easy to cook. Great choice for teaching someone HOW to cook. Customization for larger families. Try it: Use my referral code to get $30 OFF your first box! HELLO FRESH: Best for couples or families who have no dietary restrictions other than vegan or vegetarian. FRESHLY: Best for people who don't want to cook, lunches to bring to work or school, "fend for yourself night", singles. Try it: Use my referral code to get $40 off your first two weeks.